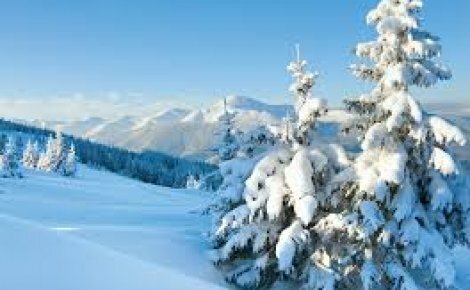 Don’t you think that winter is just wonderful? Everyone sitting by the fire, mugs of hot chocolate warming up your fingers as you watch the snow build up outside, sharing stories – I just LOVE winter! As much as we love the warmth that comes along with the fireplace, the dust and dryness in the house are not our favorite things to deal with. And since we are going to be inside the house anyway, it’s a good idea to get some things done and get started on the big Spring Cleaning, don’t you think? This way, the house gets clean and you will have reduced a lot of work come spring. Here is a Winter Cleaning guide by My Cleaners London Ltd. for your home to ease you into your spring cleaning. Alright, let’s get started! Wash windows and sliding glass doors with equal parts rubbing alcohol and water to clear snow buildup and enjoy an unobstructed view from your windows. An operating furnace inside a house means a lot of dust and debris floating around the house. Change your furnace filters regularly to keep your furnace in top shape and minimize dust buildup. Dust can accumulate in and around computer peripherals during winter months. Cleaning the computer is a good idea and to do so, unplug the computer after turning it off (obviously!). To clean dust and crumbs off the keyboard, turn it upside down and give it a couple of taps. They should fall out easily. Dust off and wipe the external surface of the CPU and other hardware components with an all-purpose cleaner. However, we recommend that you do not try to open up the computer. Leave it to the professionals as you might cause damage to the computer. It makes sense that the mattress you sleep on probably has a lot of bacteria, dust and dead skin cells that you shed off while sleeping. Vacuum your mattresses to ensure that you do not sleep on top of a pile of your own dead cells. Flip the mattress over and vacuum the other side too. Ideally, you should flip your mattress every six months. Send items to the cleaners after you are done with the holidays. The items include the holiday party clothes with fancy lace, the curtains and the likes. You can also use this time to actually de-clutter. Check out our infographic guide to decluttering. You probably use salt to clean up the snow outside the house. However, when you bring in the snow and salt inside the house with the shoes, you must deep clean your carpets. If you have hardwood floors, you must clean them regularly to prevent the whitish stains (from the snow and salt) from becoming permanent. Dusting is absolutely important in winter months as it tends to get dry and dusty because of the increased temperature from the heaters/fireplace. 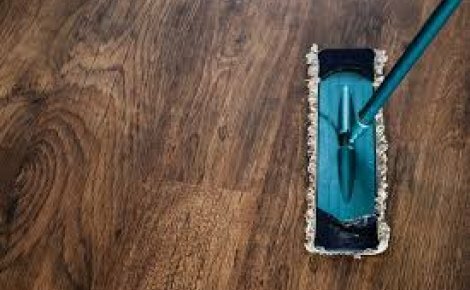 When you dust, it is advised to dust in a “top-to-bottom” manner so that dust doesn’t fall and settle on the areas that have already been cleaned. Do not forget to dust off unnoticeable areas in the house like the ceiling fan blades and the top of books in the shelves. Get your air ducts professionally cleaned in the winter. Clean air ducts result in reduced dust, allergens and germs and a furnace that works more efficiently. Don’t we just love to have the warm winter sun come inside the house? However, if you have a fireplace or use candles inside the house, more often than not, your window will have developed a thin layer of soot on the inside. Use a mixture of equal parts water and vinegar to clean up the soot. Then you can enjoy the sun all you want! Getting stuck inside the house in winter has one major advantage – Kitchen wall grease clean-up! We are all familiar with the sticky-icky gunk that builds up on the kitchen walls, thanks to moisture, fumes and smoke from all the cooking. Dish soap, a bucket of warm water, a sponge, elbow grease and some scrubbing is all that takes to clean it up. Let the ashes from your last fire cool down for at least 24 hours after you burned them. There is going to be a lot of flyaways during cleaning. Minimize them by sprinkling used ground coffee over the ashes. Next, remove all large pieces of wood from the fireplace. Throw away the ones that are completely burnt out. 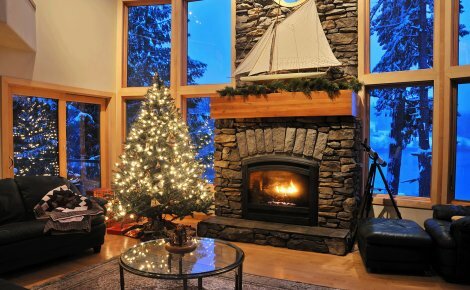 With a fireplace brush, sweep around the interior walls and use a vacuum cleaner to clean away the dust. If your fireplace has a brick exterior, spray water to clean any soot that might be there. Then, use the hearth cleaner. If the bricks are older than 50 years old, skip on the hearth cleaner. Scrub away with a brush, spray water and dry it with a soft cloth. If your fireplace has an iron exterior, spray with hearth cleaner, rinse the area with water and use paper towels to dry. If the fireplace has marble or stone exterior, spray away the residue with water, clean around the area with dish soap, rinse and dry. We love sitting by the fire as much as we hate looking at the soot-stained walls. I have a love-hate relationship with the fireplace. *sad-face* Wall paint jobs are expensive and even if we try to do it ourselves, it takes a lot of effort. Next to getting a new coat of paint over the soot stained one, cleaning the soot off the walls is the best alternative. Excess soot will inevitably fall on the ground as you clean. Lay down some old newspapers or tarp on the ground to catch the excess soot. Fix the plain attachment over the vacuum cleaner and vacuum the soot working in a “top to bottom” manner to collect any loose soot. Now, with the brush attachment affixed to the vacuum cleaner, remove any additional loose soot working in the same “top to bottom” fashion. Use a cleaning sponge (a dry one!) to clean the soot up by dragging it down the entire height of the soot-covered area and repeating. Do not scrub. Scrubbing will lead to more smearing and smudging of the soot stain. Make a de-greasing solution by mixing a bucket of warm water with some dishwashing detergent. Clean the soot-stained area with it using a standard sponge (a clean one) or a sponge mop. Gutters are best cleaned before winter sets in. However, if you didn’t winterize your home beforehand, no time like now. Rake away debris and fallen leaves out of gutters and downspouts and dump them in a bucket or a garbage bag. Check all openings that channel water into downspouts for any leaks that might have occurred. If you happen to find some, seal them up with a sealant like “putty”. Fallen twigs and leaves are most likely to clot your gutters. Prevent your gutter from clotting by installing gutter guards near tress around your home. If your home is prone to ice fills, consider investing in a heat cable that goes along the edge of the roof gutter. They work extremely well and will reduce your work, too! Prevent ice dams by installing heated cables to run along the edge of the roof. You can keep ice dams at bay by equalizing the roof’s exterior temperature with that of the inside. If you have an ice dam that is leaking into your house, a box fan is just the quick fix you need. Take the box fan to the attic and turn it facing right at the origin of the leak. Turn on the fan and watch the water freeze in its tracks. Uniform temperature on the roof and the eaves is the key to preventing ice dams on the roof. Spots like an uncovered hatch or a whole-house fan in your attic are the main culprits behind your home losing heat. If you have any such openings, cover them up immediately because you are losing a lot of heat from that particular area. Get a shovel with a small blade and an ergonomic handle with a gentle curve for the best results. While shovelling snow, do not try to pick up too much at once. A small shovel should do it, or you can also fill only a fourth or half if using a large shovel. You can prevent snow from sticking to the shovel by spraying cooking oil on it. Put some sand into a microwavable bowl and pop it into the microwave oven. Spread the warm sand over icy sidewalk. Spreading warm sand over ice works better than just regular sand because warm sand gets embedded into the ice and creates a gritty lop layer. We hope our guide helped you! Let us know how these tips go for you. Also, do let us know if there are certain cleaning problems that are bugging you. We would be glad to help you find a solution with you.